Custard is a culinary preparation based on a cooked mixture of milk or cream and egg yolk. Depending on how much egg or thickener is used, custard may vary in consistency from a thin pouring sauce to a thick pastry cream used to fill éclairs. Custard is usually cooked in a double boiler, or heated very gently in a saucepan on a stove, though custard can also be steamed, baked in the oven with or without a water bath, or even cooked in a pressure cooker. Custard preparation is a delicate operation, because a temperature increase of 3 - 6°C leads to overcooking and curdling. Generally, a fully cooked custard should not exceed 80°C ; it begins setting at 70°C. A water bath slows heat transfer and makes it easier to remove the custard from the oven before it curdles. Most common custards are used as desserts or dessert sauces and typically include sugar and vanilla. Custard bases may also be used for quiches and other savory foods. Sometimes flour, cornstarch, or gelatin is added as in pastry cream or crème pâtissière. Mixtures of milk and eggs thickened by heat have long been part of French cuisine. Custards baked in pastry (custard tarts) were very popular in the Middle Ages, and are the origin of the English word 'custard': the French term 'croustade' originally referred to the crust of a tart, and is derived from the Italian word. 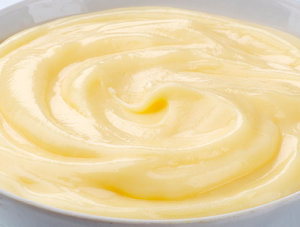 In modern times, the name 'custard' is sometimes applied to starch-thickened preparations like blancmange and Bird's Custard. Custard used to make Various dessert Items Like Muhallebi, Bavarian cream, Boston cream pie, Bougatsa, Cream pie, Crème brûlée Crème caramel, Custard tart, also called egg custard. Egg tart, English trifle Flan, Floating island, Frozen custard, Galaktoboureko, Kremna rezina, Natillas Pastel de nata, Taiyaki, Vanilla slice, Vla, Zabaglione.